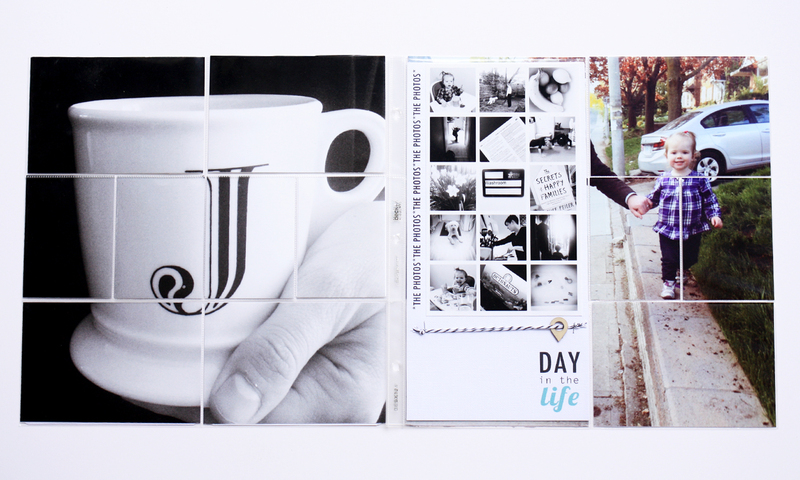 Last year, I wrote a blog post on how I incorporated Day in the Life into my Project Life album. I am slowly working on getting my archives in order…sorry for no link – please forgive my tardiness! 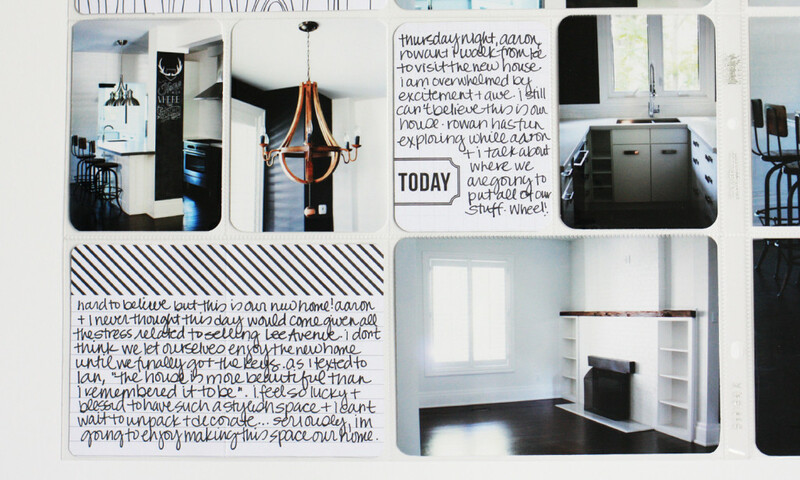 That post was a fun way to show you how I used a repeating design theme within the context of Project Life to document a Day In the Life. Today, I thought I would revisit the topic and show you how I am capturing DITL in PL in twenty fourteen. Cool? Cool! Let’s do this! The biggest difference from 2013 to 2014 is that I am simplifying my design. 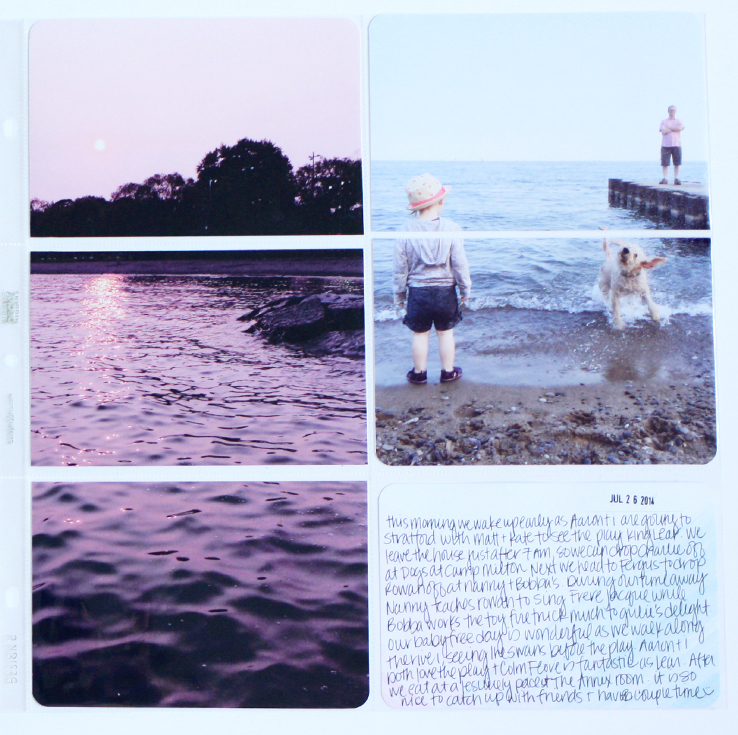 Instead of incorporating 16 + photos (one enlargement and 15 in grid form), I am including 8 photos in my album (six 4 x 6 landscape and two 6 x 12). Instead of using my computer + different fonts to capture my thoughts, I am strickly using my handwriting and Project Life journalings cards. Instead of documenting my thoughts on my blog, I am journaling directly into Instagram as I take the picture in the moment. I am totally embracing the mantra: something is better than nothing! Obviously, I am still heavily relying on technology to document various moments in our day to day life. Like last year, my iPhone continues to be my camera of choice. Like last year, I try to edit my photos in the moment and do so using PicTapGo – my current favourite iPhone app. Like last year, I continue to convert my photos to black and white. 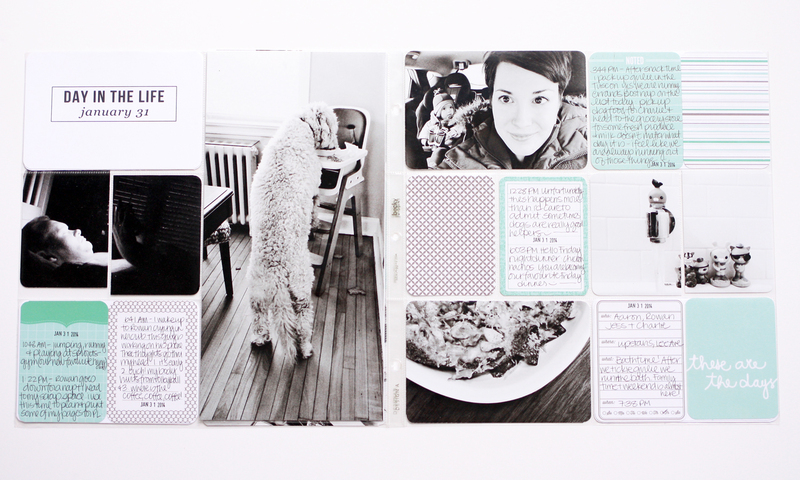 I find it easy and simple to design a page with black and white photos. It gives the classic look to my album. Win win! Regardless on how I capture our memories, I am just so freaking excited that I some these small moments / stories down on paper. Looking back on these 4 layouts over these past 2 years, I see how much Rowan has grown, the different parenting stage I am at and how much we have grown together as a family. How cool is that? Growth, evolution, history all displayed through a few photos. No doubt, I try to keep documenting our life in this format moving forward. What about you? Do you participate in Day In the Life? 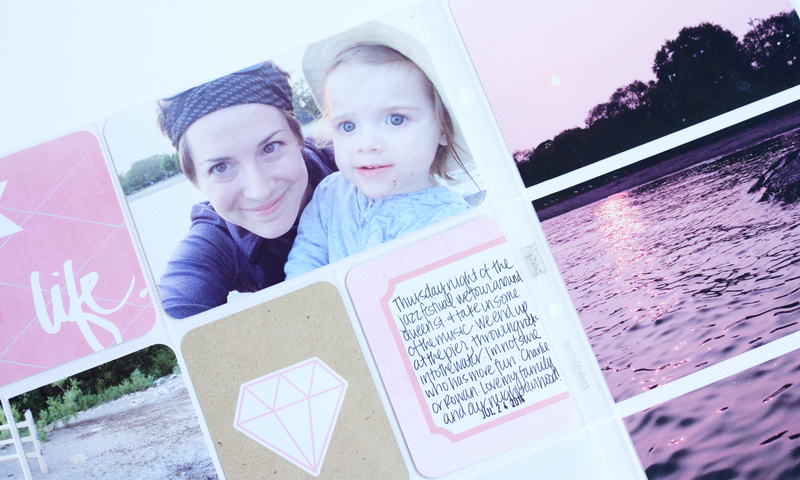 How you scrapbook your photos and words? How is summer over? I mean, didn’t this just happen yesterday? This week, I played around with two sizes of enlargements. Typically, I blow up the “best” photo to create a statement, but I couldn’t decide which picture I liked better. I love the picture of the sun setting as well as the one of Charlie, in action, getting out of the water. So two enlargements it is! Hooray for indecisiveness! 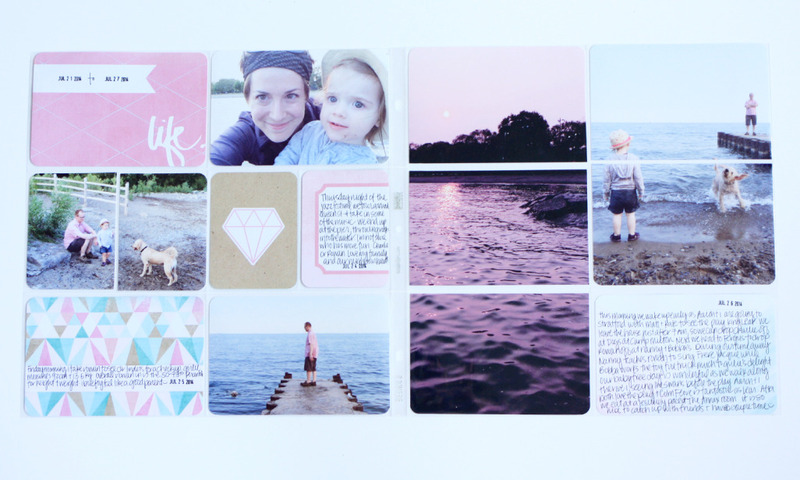 On the left, I used Design A age protector and on the right, Design C. All cards are from the Dreamy Core kit, by Heidi Swapp. Fun fact: the journalling doesn’t match all the photos. For some reason, I find it easier to design a page when all the photos “match”. Maybe I’m crazy, but that’s how my mind works. In addition to documenting our relaxed evening outs to beach, I also documented / wrote about our trip to the doctor and to Stratford to see the play, King Lear. Another week in the books! If you are like me, when Ali says, “jump” – I often respond with “How high?”. No doubt that I am a keen follower. 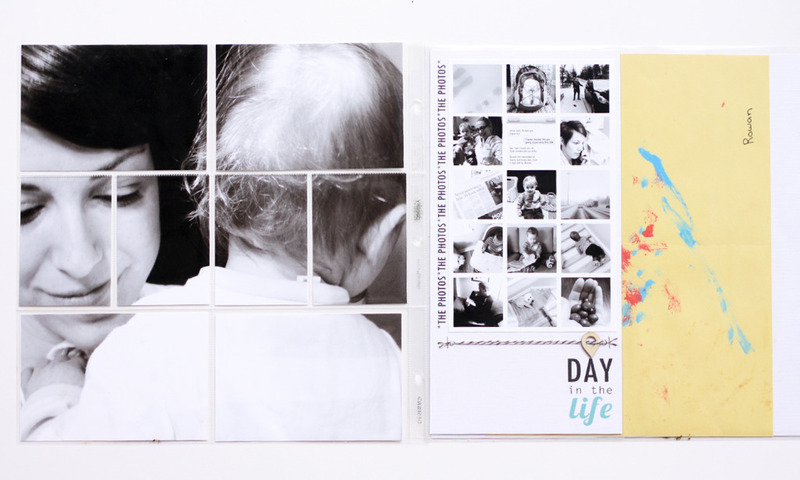 So when she mentioned last week on her blog on how she included her partner’s perspective in her scrapbooking, I started to reflect on how Aaron has helped to documented our lives. See, I am a lucky gal, who has a super supportive husband. He “gets it”. No only does he encourage me to document our daily lives, he also helps to record our memories. Below are a few ways, Aaron has shared his perspective in my memory keeping. Aaron is always quick to let me know if Rowan is doing something cute. He will call me or snap something himself if I am not around. The large picture of Rowan brushing her teeth is one example of how he encouraged me to get my camera. And when I say, “encouraged”, I mean “told me to I better come quick….and bring the camera”. Seriously, I don’t know what I would do without my iPhone…..Ok sorry for being so dramatic. I would survive, but I would hate lugging my DSLR around all the time! 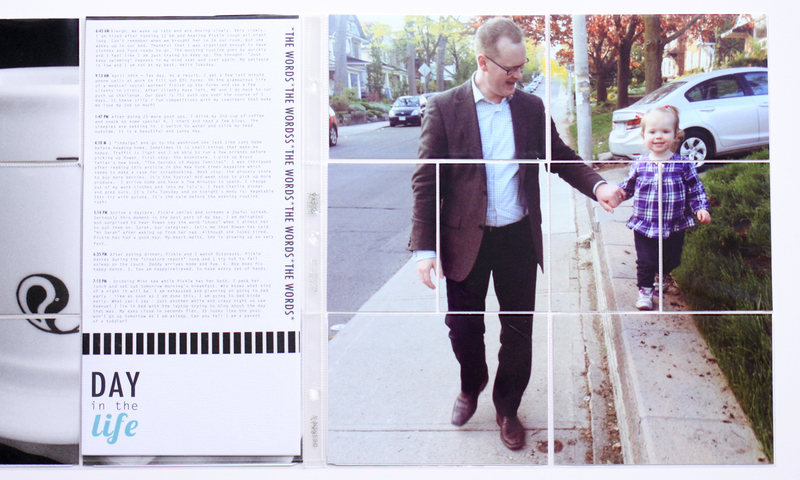 Back in 2011, I created a pregnancy album that highlighted my journey from conception to birth. 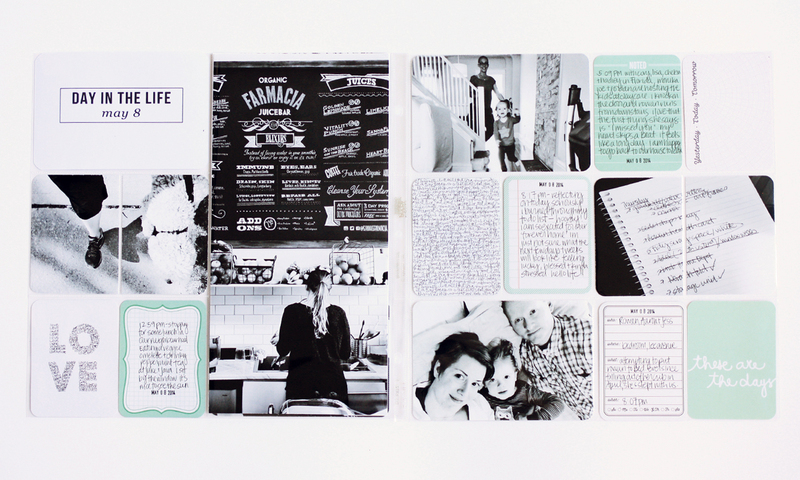 It was before I started Project Life but essentially was a mix of pocket pages and traditional layouts. 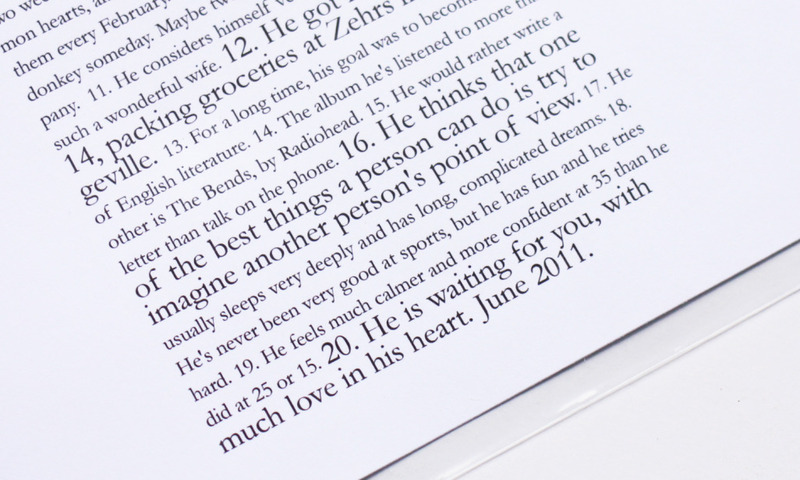 It included this layout, which had 20 facts about Aaron that he wanted Rowan to know. Aaron happily obliged and wrote some really lovely things. Essentially, I created and formatted a document in word, based on a sketch from Ali’s Yesterday and Today class, and Aaron wrote. and wrote. and wrote. Swoon!!!! Three years later, I still love what he shared. 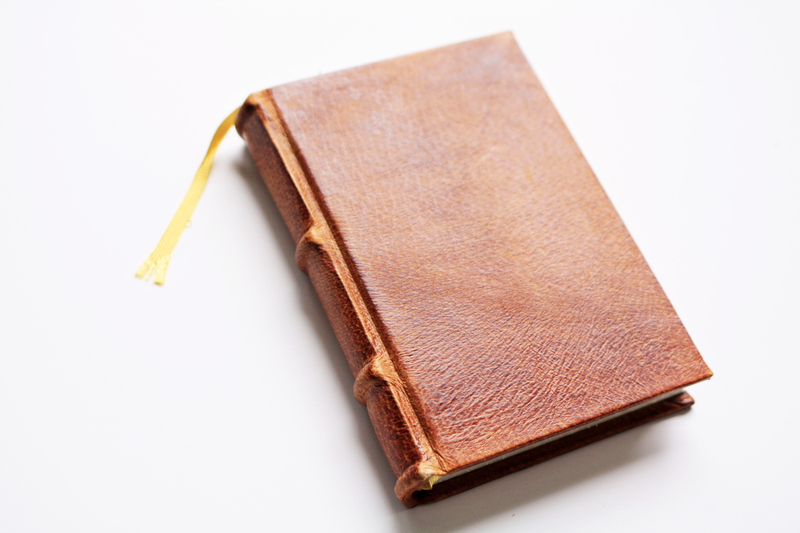 Lastly, on the day that Rowan was born, Aaron started to write in a leather journal he bought in Italy in 2009. It’s a mix of serious, silly and sentimental thoughts and notes. I love that he is doing this and that it is his own thing. Also great? His hand writing! What a keepsake! Bottom line: Aaron is supportive of my memory keeping efforts and participates. He is not always a fan of selfies – but who is? Seriously, I am thankful. Is your significant other supportive of your memory keeping ways? How have they helped you record your memories? I’d love to hear! 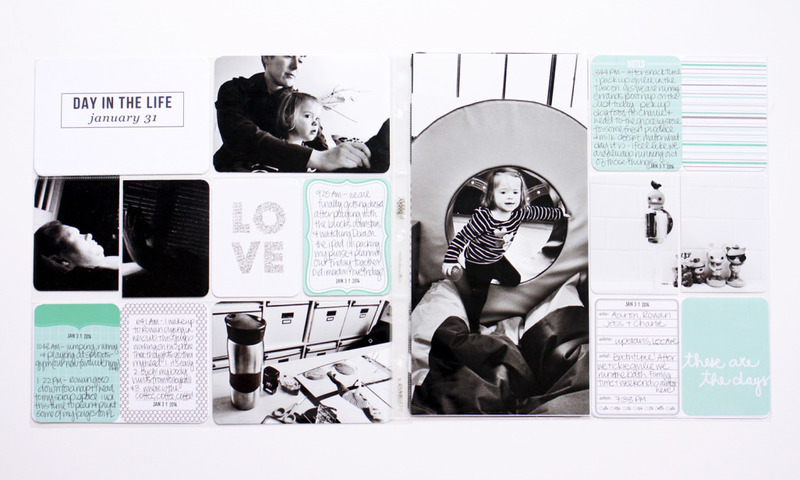 No toddlers were hurt in the making of this Project Life spread! Promise! You may remember a few weeks ago, I did some baking with my girlie in our new kitchen. We were in the midst of unpacking and I unfortunately didn’t take many photos from this week. No problem! I did take *ahem* a few of our first kitchen adventure. 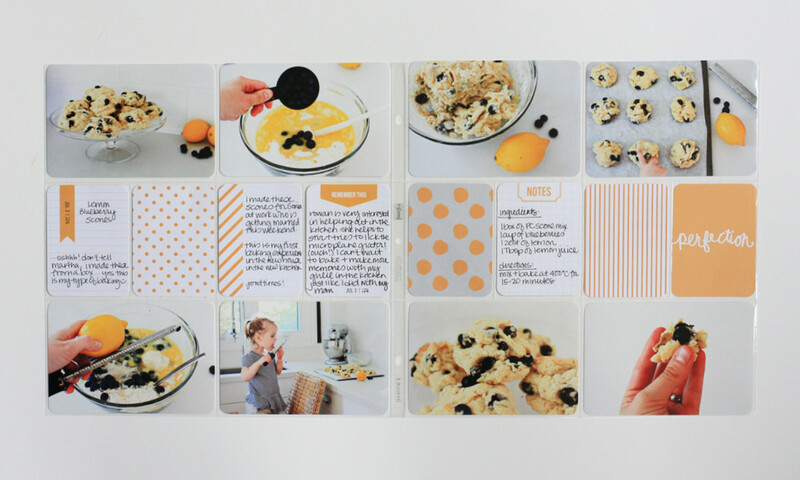 Eh Viola – a baking Project Life spread was born! I know this spread doesn’t represent the entire story of our life and I am ok with that. I am really good a remember the stress and not always so great a remember the small little fun details. Looking at these photos makes my heart skip a beat. I loved baking with my mom and I hope to continue that tradition with Rowan. 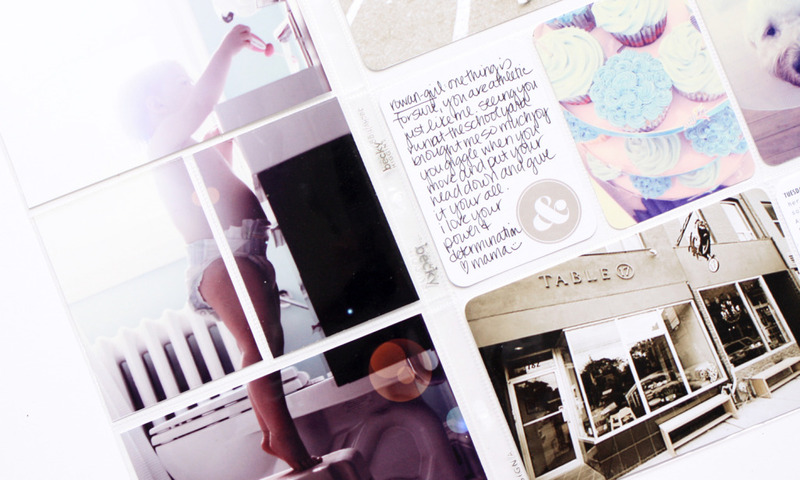 And as the journaling card says, I didn’t make them from scratch – but instead from a box! I haven’t used many of the yellow cards from the midnight kit. Yep, I have a whole stack of them just sitting in the kit. 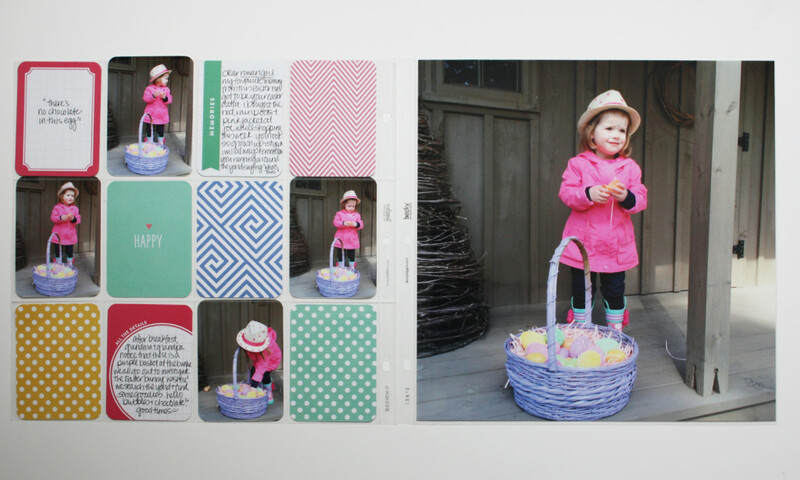 When I printed these photos, ones with a neutral white background and limited colour scheme, I knew immediately, that I could use 8 of them across the double page spread. It a very basic template but I like how stylish it is. 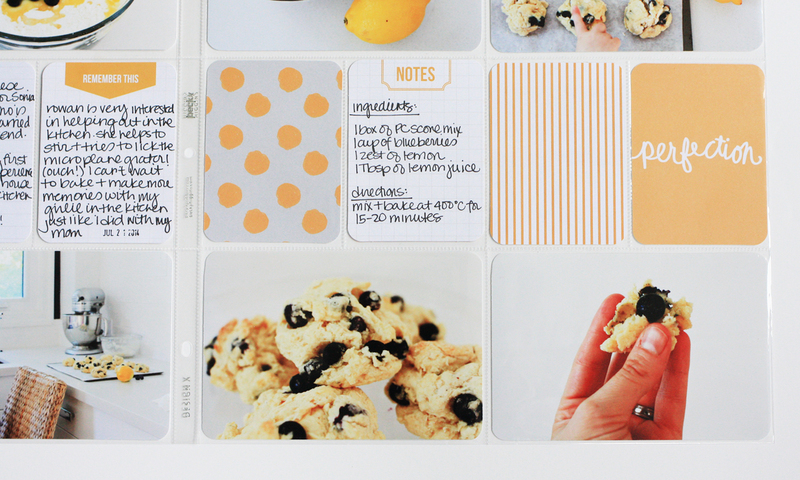 Have you used Project Life to document your recipes? Empty house pictures? Yes, please! 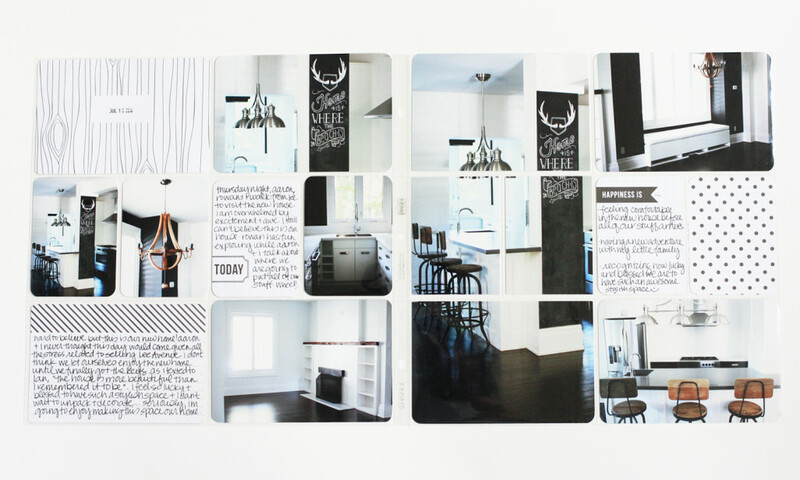 For this spread, I combined two weeks into one and focused on one major topic: moving into our new house. Moving means life can be chaotic. Add summer onto this equation and Project Life gets put on hold. After documenting life for 3 years, I recognize and accept that enjoying summer it’s part of the and ebb and flow of my creative work. No worries, stress or guilt here people! Summer weather is to be enjoyed and it’s super easy to “catch up” of Project Life – especially if you keep things simple. 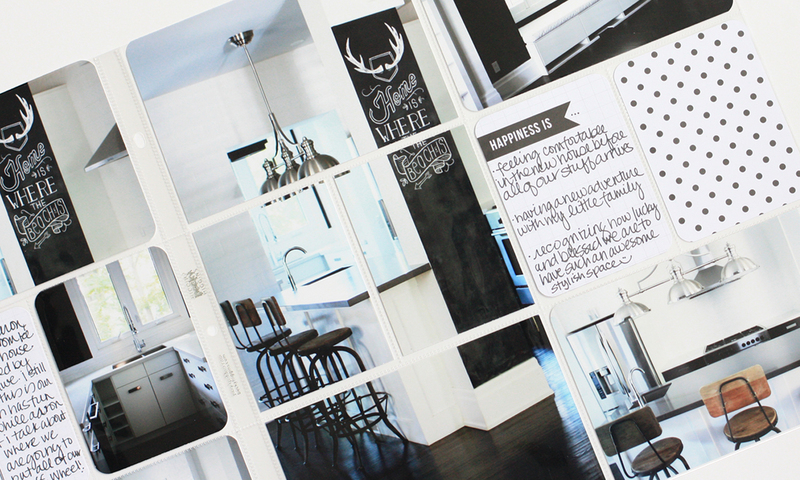 Take for example Exhibit A: aka the enlarged 6 x 12 photo of our kitchen in the middle. I heart large “statement” photos! 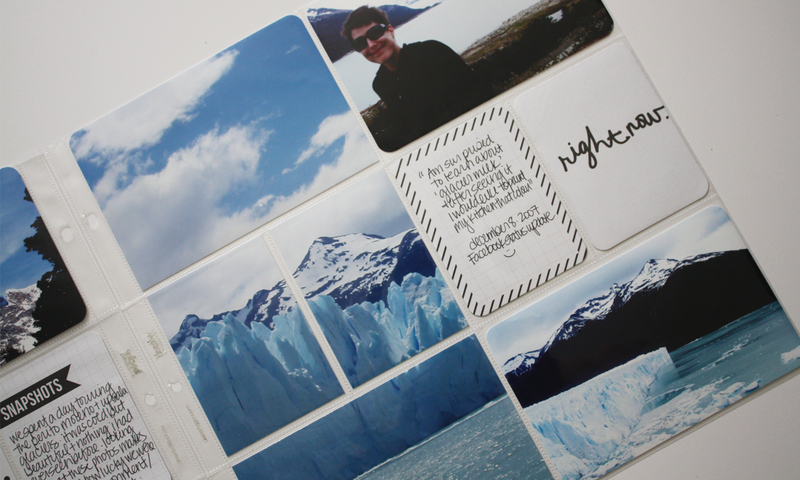 Journaling cards reflect the feelings of the two weeks including the highs and lows. 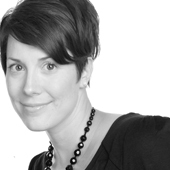 Thanks to texts, blog posts and general reflections on the moving process. Layout includes Design A page protectors and cards from my favourite PL edition: Midnight. Do you “take a break” from Project Life in the summer? If so, do you feel guilty or stressed about the break? 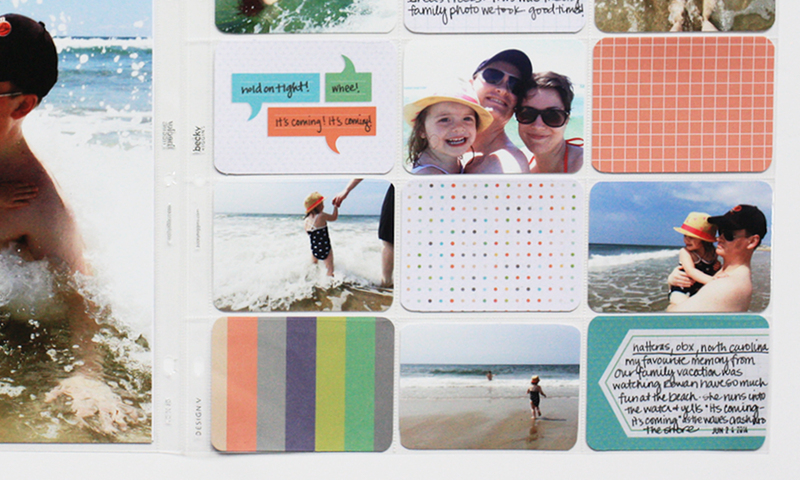 What happens when you become a scrapbooker AFTER you’ve taken some awesome vacations? 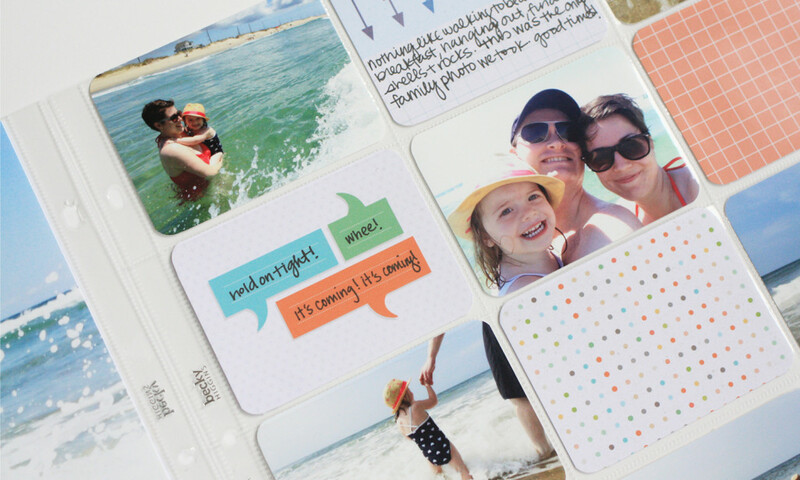 Why scrapbook them – of course! 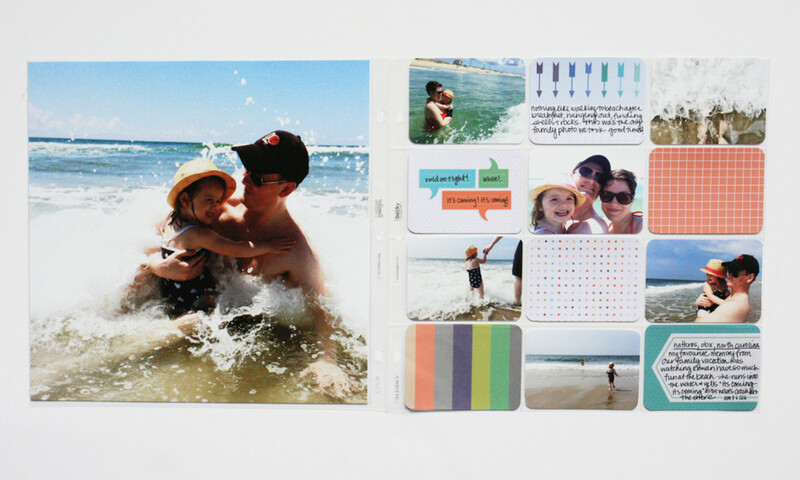 It’s no secret, at this moment in time, I am a chronological scrapbooker. Yes, since 2012, I have documented our lives in somewhat consistent order. Does that mean that our everyday lives is the ONLY thing I document with Project Life? Heck no! In between selling our house and moving, I found *cough, cough* made some time to print out these pictures from our 2007 trip to Argentina and Chile. 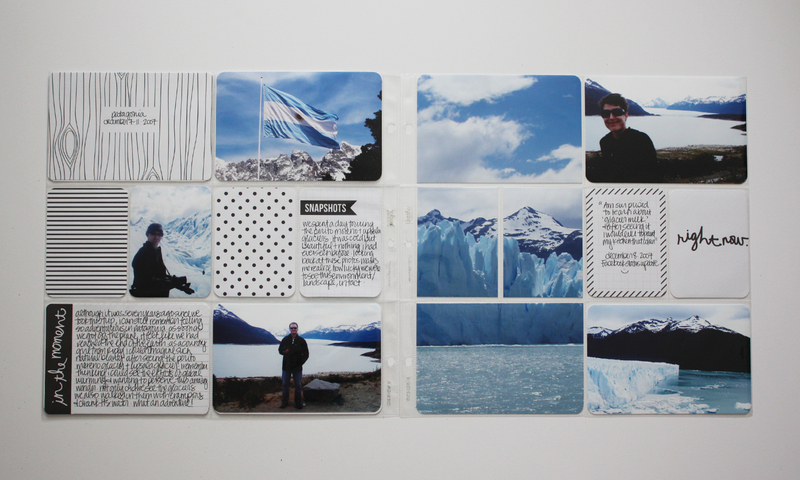 This particular spread is of our time in Patagonia. 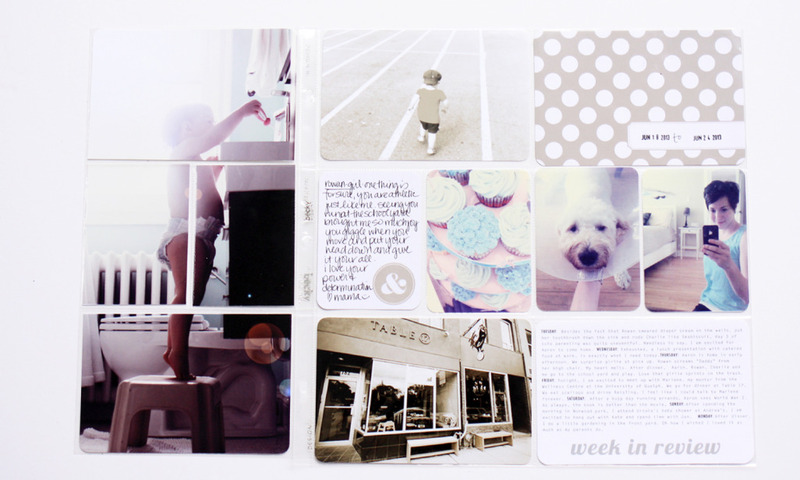 You may have noticed that this spread has a balance of photos and words. 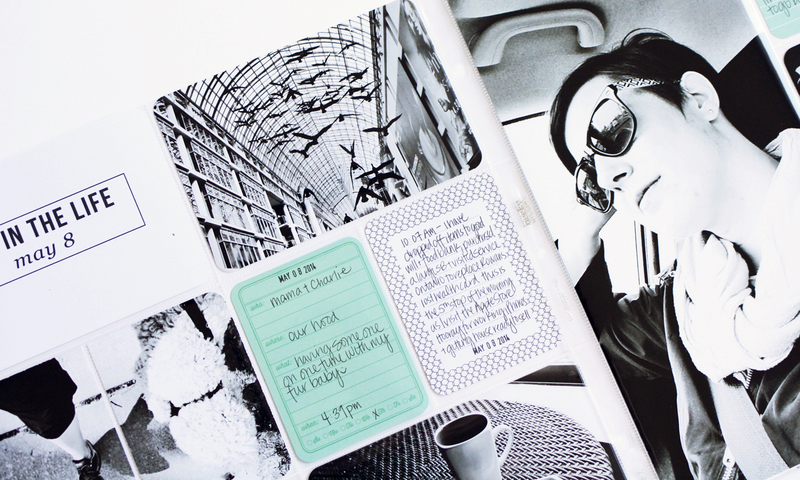 I don’t believe you have to scrapbook every photo you take and think journaling can help you tell the story just as much as your photos. Recognizing that my memory isn’t as good as it use to be – thanks mommy brain, i’m still waiting for my memory to be fed ex’d back to me – I took to Facebook to search my old status updates. 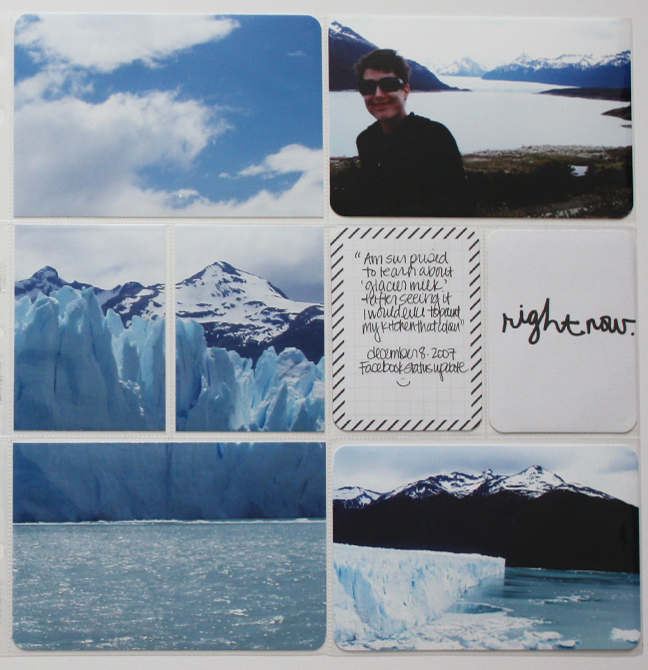 Since the trip was 7 years ago, I used social media to get an idea of what I was thinking and feeling during our time visiting the glaciers. It is awesome to have access to this kind of information. Hooray for technology! Apparently, I thought I so funny back then! 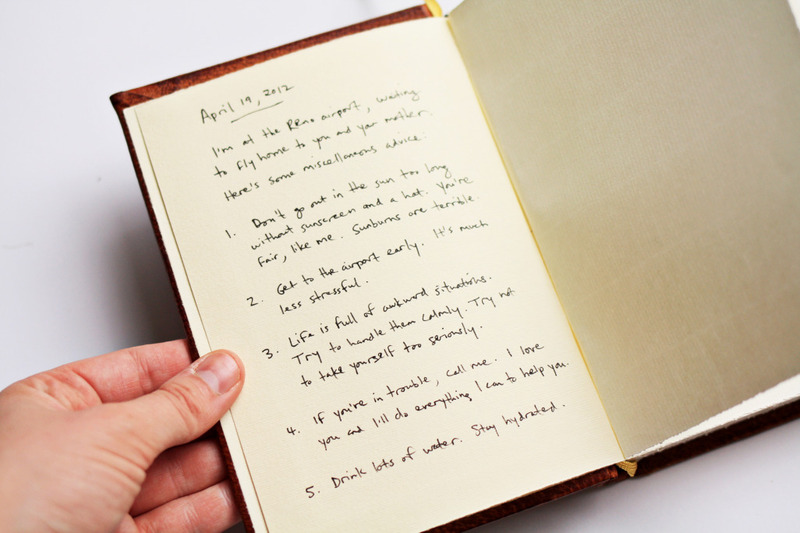 The another way I incorporated journaling was to reflecting on what I had learnt during our travels. I believe that pictures only tell part of your story – journaling your thoughts and feelings can help give context and meaning even if it’s 7 years after an event. 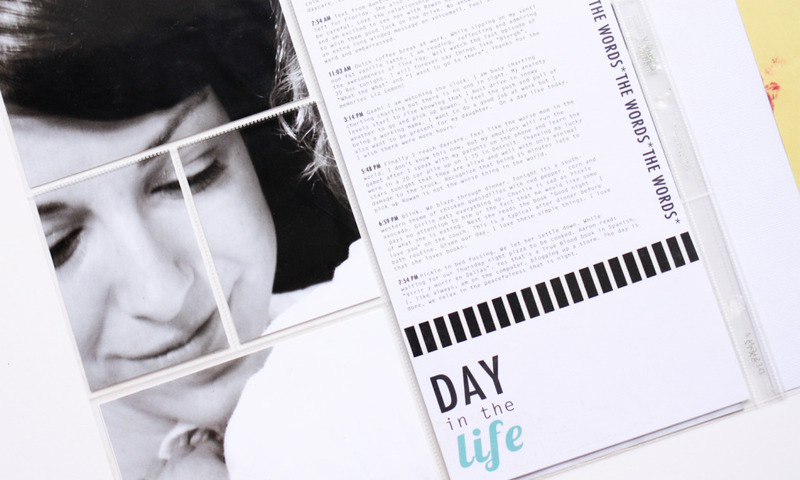 With simple colour scheme of black, white and blue, this layout came together in no time flat! 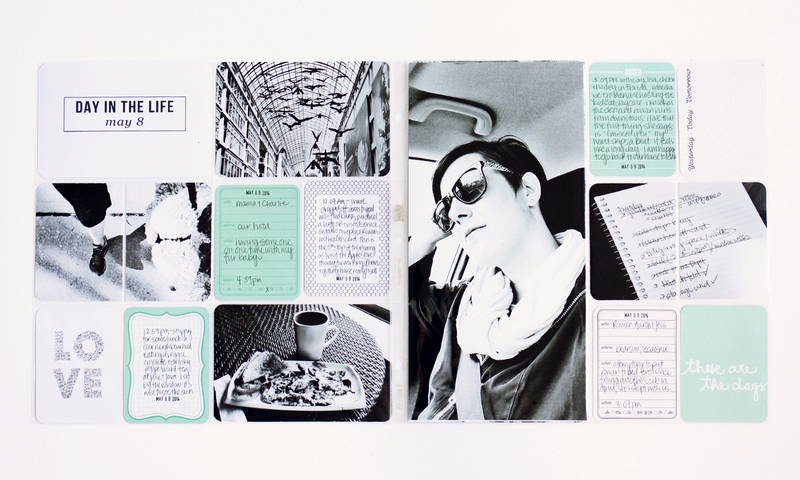 This layout uses Design A page protectors and journaling cards from the Midnight Edition. How do you document past vacations? Vacation week – otherwise known as the week I photographed wearing a bathing suit! Hooray !?! During the last week of June, we travelled to Cape Hatteras and rented a house on the beach. Simply put, we had an awesome time. Really, there is nothing like waking up having breakfast and spending the day by the ocean. Rowan loved running into the water and watching the waves crash into the shore. Seriously, I don’t know how many times she yelled, “It’s coming, it’s coming” and pointing to the waves. 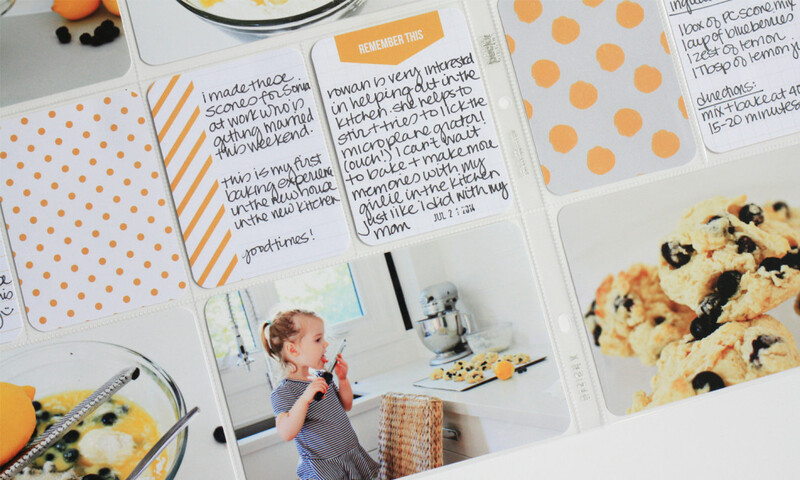 A fun story like that deserves it’s own journaling card. For this layout, I use cards from the Coral Edition. The blue, green and coral colours seem to coordinate nicely with our photos, especially my 12 x 12 “statement photo” of Aaron and Rowan. On a sad note, the week after our vacation, Hatteras was hit by Hurricane Arthur right before the July 4th long weekend. We hope that OBX, Outerbanks will recover from this storm and that people continue to visit. It really is a beautiful place. 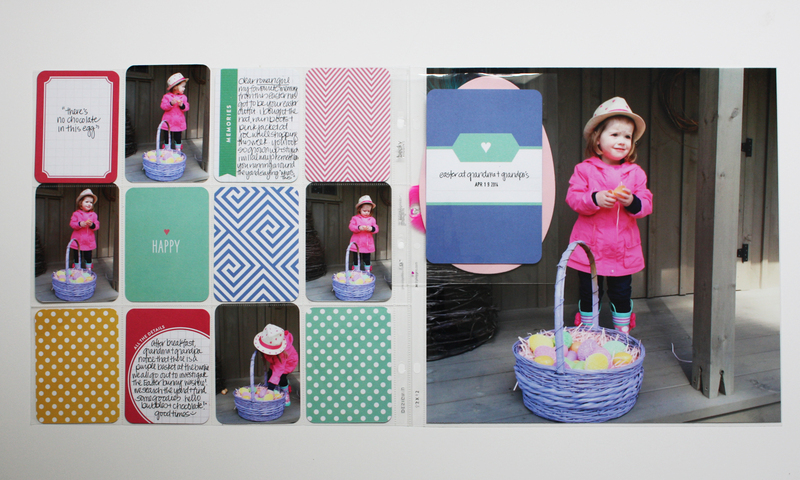 Page protectors on this layout include: a 12 x 12 and Design V.
Who doesn’t love an Easter spread in August? 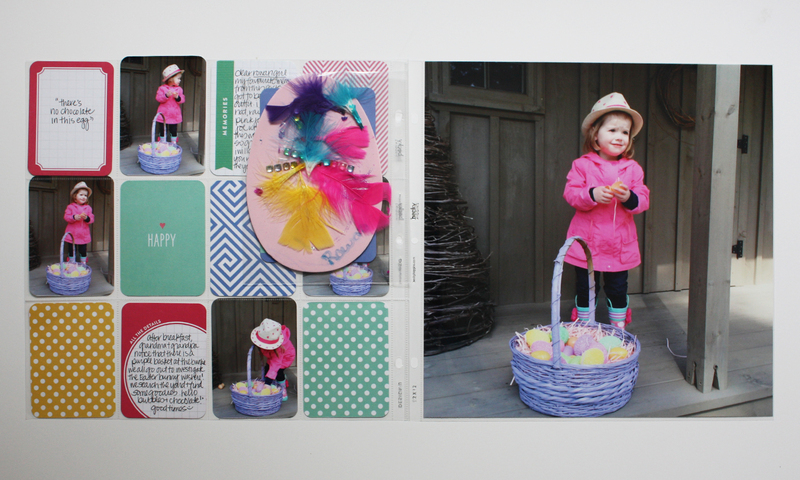 Yes, here is another two page spread completely devoted to easter bonnets, egg hunts and my girlie. 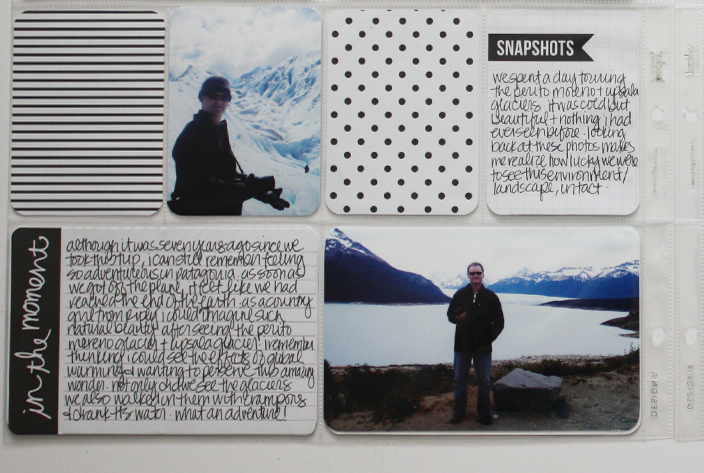 All cards are from the Strawberry edition, which, FYI, may be my favourite Project Life edition so far! I love the bold patterns and bright colour palette. When I look back at this spread, I am reminded that, in addition to celebrating all things spring, we were in the middle of house hunting. When life gets busy, my Project Life spreads switch from weekly documenting to event capturing. For me, I don’t care if I switch things up, or miss a week here or there. I love to create and my motto is something is better than nothing! 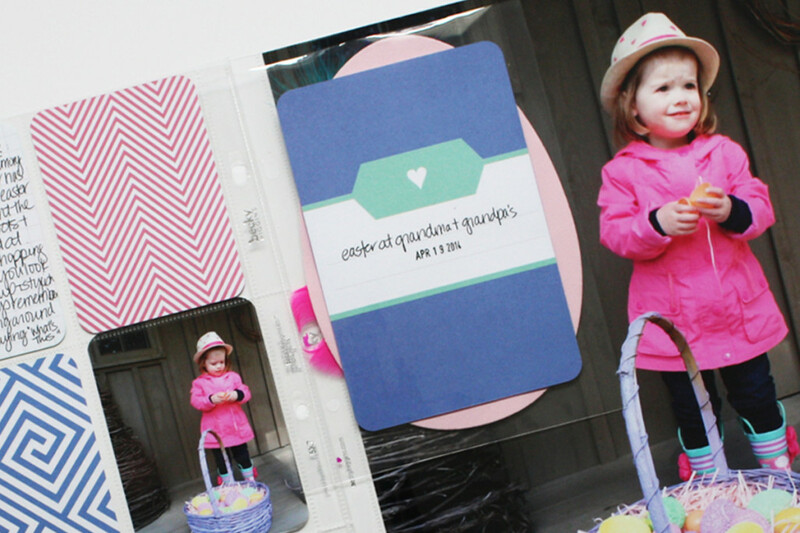 I added a 5×7 insert with an egg craft Rowan completed at daycare. In the above photo, you can see that I attached a title card with some information and the date. In the future, as the number of crafts coming home increases, I plan to photograph Rowan’s art as oppose to including it directly in my album. This egg is a “masterpiece” and matches the colours in the spread so into the album it goes. Rowan’s outfit: Hat, jacket and boots from Joe Fresh; Jeans from osh gosh. How do you handle the busy periods? Do switch up weekly documenting to themed based pages?